Help us tell Raleigh to Stop Medicating the Public Water Supply! The City of Raleigh has systematically medicated the public water supply by majority vote since December 11, 1956 (Source). For 57 years the citizens of Raleigh have consumed a constant supply of liquid medicine commonly known as “Fluoride” through the tap water which is distributed by the City’s three main treatment facilities. According to the City this medicine is instrumental in preventing cavities among the population when consumed in drinking water. The cost to administrate this medicine to the drinking water is over $500,000 per year. 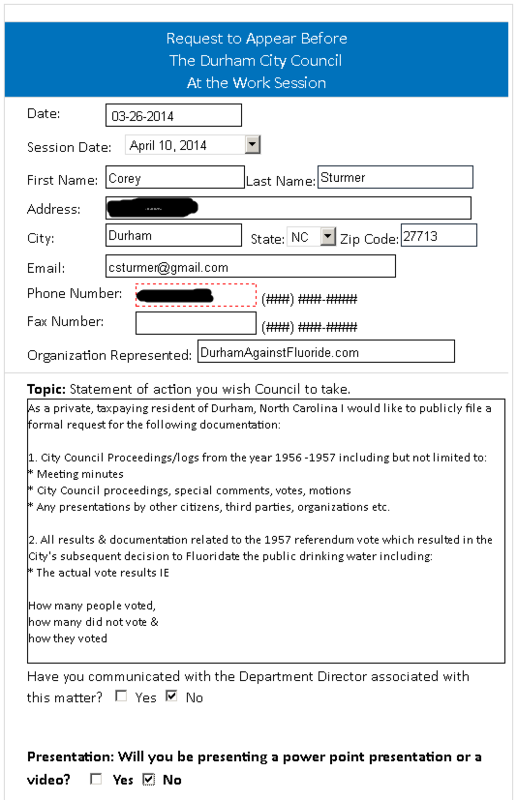 On February 5, 2013 at the public comment portion of the Raleigh City Council meeting I will be asking Mayor Nancy McFarlane whether she believes citizens should be prescribed medicine before they consume it. I would like to point this question squarely at Mayor McFarlane because prior to serving as Mayor she was a licensed Pharmacist (source) and is trained and required by law to only distribute medications to those who are prescribed it. No matter where you stand on the efficacy of water fluoridation for preventing cavities – this simple question to Mayor McFarlane should demonstrate very clearly why the City has no authority to treat the citizens without consent. Even if the policy is well intentioned we should all be able to agree that allowing city officials to make medical decisions for the citizens by majority vote and through the water supply is a dangerous infringement on our medical & health freedom. I expect Mayor McFarlane to agree given her prior pharmaceutical background and extensive training on this subject.